I ordered some beautiful napkins and could not wait to try some decoupaging with them.. something I have seen but never actually done myself. I have decoupaged items using prints and wallpaper but never napkins.. 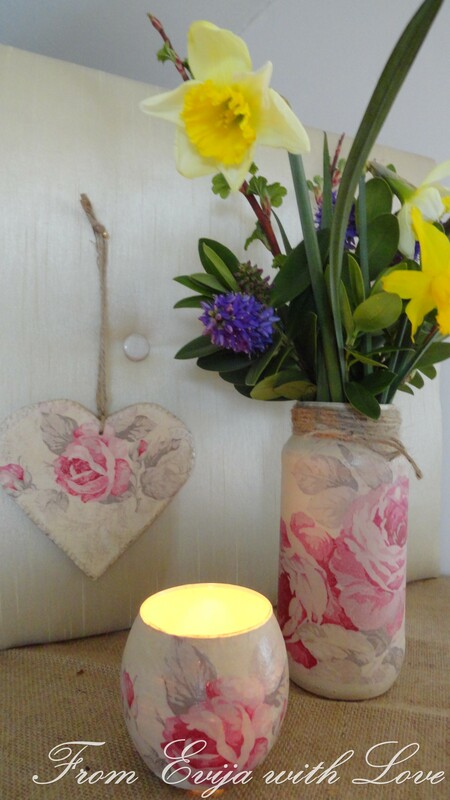 I decided to do a lovely vintage rose set – love heart, tealight holder and a vase. I decided to practice my jigsaw cutting skills and made everything from scratch. If you are not feeling very adventurous you can order pre-cut shapes such as these online. 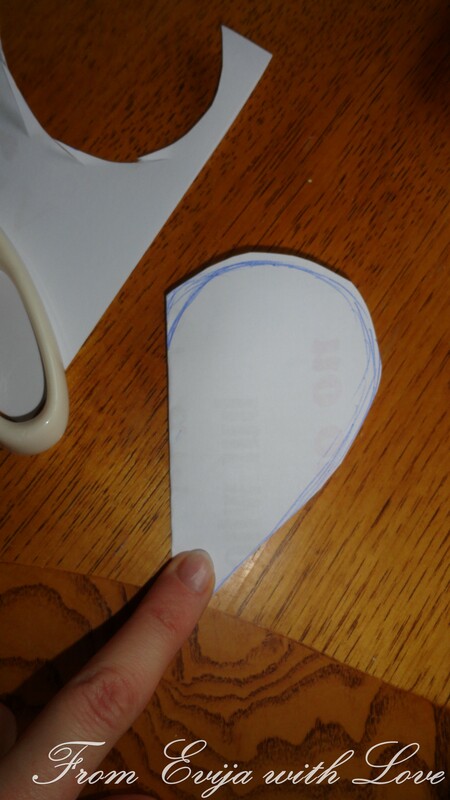 First I drew a heart shape and cut it out of the paper. 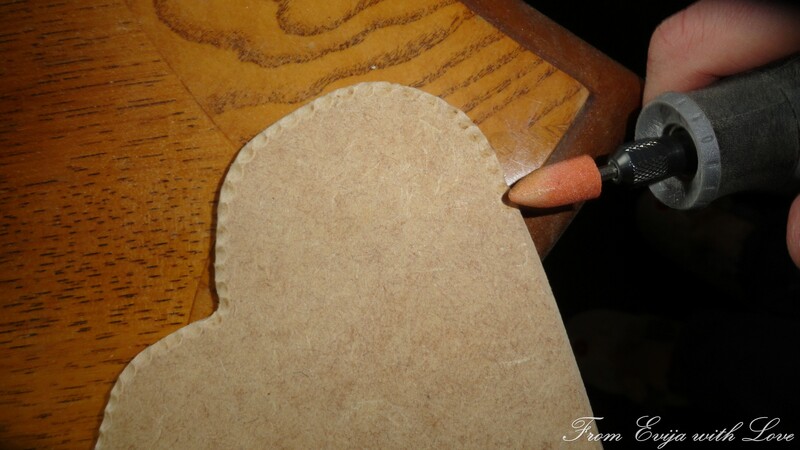 Then traced the shape on to the mdf boar and carefully cut out the shape using my jigsaw. Thankfully, it was not as hard as I first thought. I decided to play around with my dremel and cut a few shapes in around the edges. As with all my projects, I normally have an idea of what I am about to do, but most of the times I just improvise and create on the spot. I then painted the heart using Annie Sloan chalk paint in Old Ochre. I sanded in between coats and waxed once I was happy with the coverage and drilled a hole. Then came the fun part – decoupage! I covered the love heart with Mod Podge in Gloss (you may prefer the Matt Mod Podge instead both are absolutely fine) and placed the top layer of the napkin on top. I then gently covered the top with mod podge using a soft brush. After doing this, I was told that because the napkin is so thin, you don’t actually need to put any mod podge at the bottom, just over the napkin – NOTED! 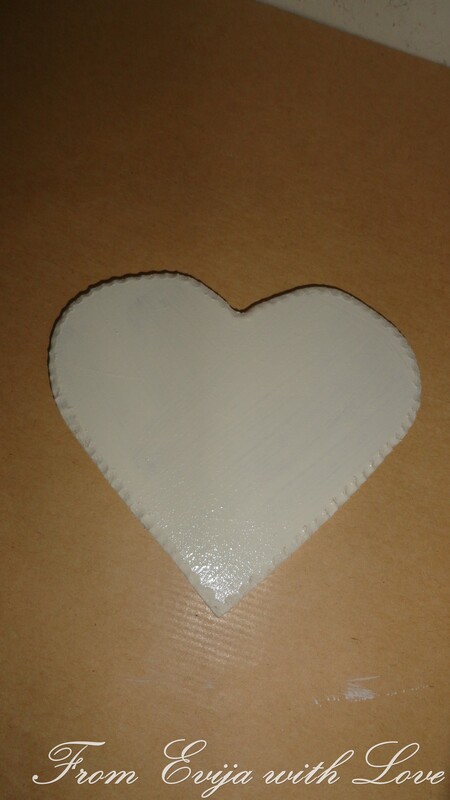 Once the heart was dry, I sanded slightly put some mod podge for extra protection and once this was dry played around with some dark wax over the edges to give some depth and make the heart look more vintage. I then put some twine on and the heart was done! My next job was the vase and the tealight holder. I painted the glass jar and the tealight holder in the same Old Ochre shade and waxed. I cut out the napkin, took the top layer off and this time only put mod podge over the top. Once they were dry, I slightly sanded and put an extra coat of mod podge to seal it. I then tied some twine around the top of the jar. And this is what it turned out to look like! This post may contain affiliate links, which means we may receive a commission if you click a link and purchase something. Absolutely beautiful!!! I love them all 🙂 Thanks so much for linking w/ Shabbilicious Friday! These look beautiful! I love using napkins for decoupage as well. Thanks for sharing them at the Vintage Inspiration Party! Evjia, your project turned out great, I love the color of course. I used paper napkins to cover eggs, there so malleable and work well on so many things. Thanks for participating in the Oh My Heartsie Girl WW this week. Hi Evija,Thanks for signing up to CO-Host with us in May, I look forward to your participation!! Thank you Karren, would love to co-host with you! have a great weekend too!! These are all absolutely lovely, Evija! 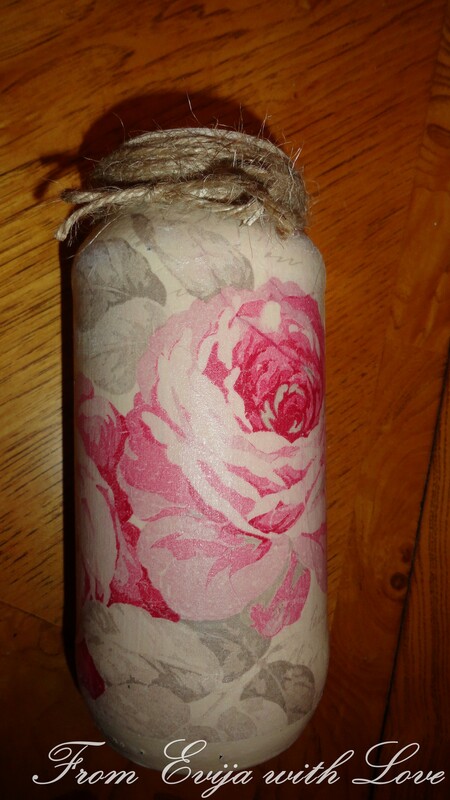 I’ve always wanted to try to decoupage! Thank you for sharing! xo Christine @CherishingaSweetLife Enjoy the rest of your week! You often see beautiful images on napkins and cards. This is a great way to preserve them.Thanks for co-hosting OMHG Wordless Wednesday with me. Love your ideas & images used for your project. Thanks for co-hosting WW. Pingback: Oh My Heartsie Girl Wordless Wednesday - Natural? I love vintage and I love crafts and this is such an original idea. I have never thought of using napkins before. Your photos look great too. I have pinned and shared your post. It’s a pleasure to co-host with you this week. I love this idea. Can you explain how you ‘wax’ and what do you use to wax or apply the wax? Does waxing always come in between coats? Thank you so much. Hi Melanie, thank you very much. Waxing is always the last step you don’t need to paint/wax then paint and wax again. You wax right at the end to seal the project. In this case really I didn’t have to wax after I painted the jar as I was still working on it with decoupage. As it was my first time I learnt from it.. And now when I paint glass and decoupage I tend to use mod podge to seal it, no wax at all, so just paint the glass, decoupage and seal with mod podge.. On my projects (either painting furniture or anything else) I use Annie Sloan wax, you put a small amount over the piece and rub it in then buff away to get that lovely shine. There is a slightly better explanation on my old chair tutorial which might be helpful.You can see it here.